Toronto’s upcoming municipal election has been thrown a curveball courtesy of Ontario Premier Doug Ford who announced that his government will introduce legislation to slash the number of city councillors by half – less than an hour after Toronto Mayor John Tory said he plans to fight the proposed plan with a citywide referendum. During a press conference at Queen’s Park on Friday morning, Ford said the Progressive Conservatives would introduce legislation “as soon as Monday” to reduce the number of city council seats from 47 to 25 before the Oct. 22 municipal election – confirming a report first published in the Toronto Star on Thursday. To make his point, Ford compared Toronto’s 47 city councillors to Los Angeles – a city with a population of nearly 4 million – that has only 15 city councillors. Ford said the legislation, if passed, will “dramatically improve” the decision making process at city hall and claimed it would save the city’s taxpayers approximately $25 million. 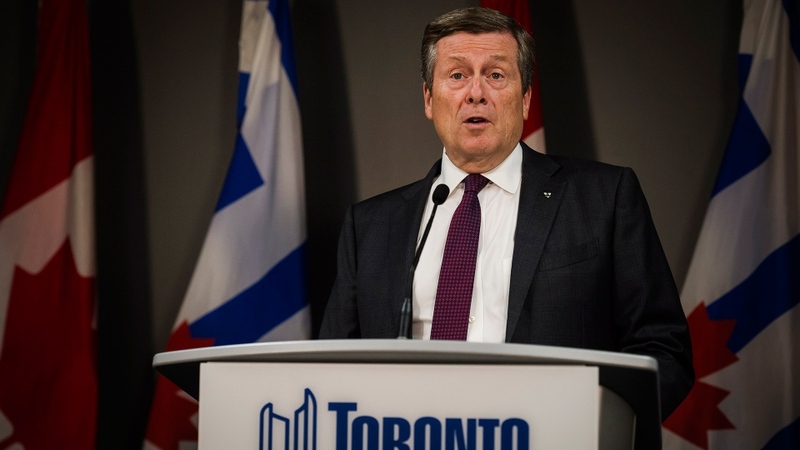 “I think Toronto taxpayers will be happy to trade a bunch of politicians at city hall for millions of dollars that can be reinvested in the city’s pressing priorities,” he said. The proposed legislation would redraw ward boundaries to match federal and provincial ridings in the city – meaning a number of current city councillors will be vying for the same seats come October. The move would undo the former Liberal’s government’s 2016 decision to increase the number of wards from 44 to 47 following a four-year review on effective representation. The news came just hours before the deadline for candidates to register ahead of the election. Ford said that deadline would be extended to Sept. 14 to give candidates time to decide where they will run, but the election will still take place on its originally scheduled date. 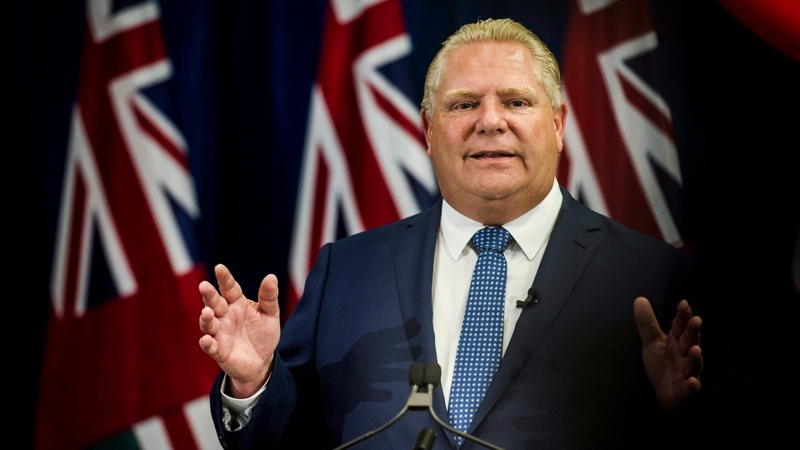 In addition to reconfiguring the makeup of Toronto city council, Ford said his government also plans to “pause” the previous Liberal provincial government’s creation of elected regional chairs in Peel, York, Niagara, and Muskoka regions in 2016. “The last thing the families, businesses, and municipal leaders in these regions need is another layer of politicians, another layer of dysfunction,” he said. The cancellation of the election in Peel Region would squash the political comeback of Ford’s predecessor, former PC party leader Patrick Brown, who resigned in January amid allegations of sexual misconduct. He has repeatedly denied all of the allegations against him. Former Liberal cabinet minister Steven Del Duca’s campaign for regional chair in York Region would also be affected by the change. Shortly before Ford’s announcement, Tory held his own press conference at city hall in which he said he would challenge the premier’s proposal by moving an emergency motion later today to instruct city clerks to find a way to hold a referendum on the matter. He said the question of whether to reduce the number of city council seats could be included on ballots during the Oct. 22 municipal election or posed in another way. “We would live with the result, whatever it is, but at least it will be the people, all of them who choose to vote, who will decide,” he said. Tory also said he had a “lengthy” and “animated” discussion with Ford following the publication of the Star’s report on Thursday evening. 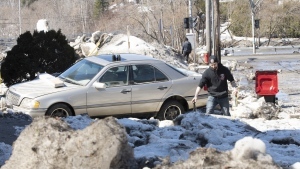 He said he told the premier that he was open to discussing changes to how the municipal government operates, but that he objects doing it in this hasty manner. When asked if he thinks Ford might be doing this because he holds a political grudge against him – Tory beat him in the 2014 Toronto mayoral election – the mayor responded that he didn’t want to speculate. “I have no idea what his particular motivations are,” he said. Ford was also asked if he was targeting Toronto city council because of a political grudge he may hold from his own time spent as a city councillor when his brother Rob Ford was the mayor. The premier sidestepped those questions and instead, repeated his earlier talking points on solving the dysfunction at city hall and getting the city moving again. After the Star first reported Ford’s intentions, several Toronto city councillors came out to voice their opposition to the possible changes. “It is our jurisdiction. It is the voice of the people of Toronto. We were duly elected and Doug Ford does not have the right to overturn the voices and the views and the decisions of the people of Toronto,” Ward 31, Beaches-East York, Coun. Janet Davis told CP24 on Thursday. Ward 14, Parkdale-High Park, Coun. Gord Perks also expressed concern about the premier’s purported plans. “If he’d wanted to run the City of Toronto, he should have run for mayor and he chose not to do that. He’s got big enough problems to deal with over at Queen’s Park,” he said. Provincial NDP leader Andrea Horwath also weighed in on the premier’s announcement in an interview with CP24 on Friday. Ford, on the other hand, said he’s already received plenty of support for the plan, including from at least half a dozen Toronto city councillors he spoke with last night. “My phone lit up like a Christmas tree last night. Every councillor I spoke to was [saying] ‘Way to go! This is long overdue. We can’t wait for the changes,’” he said. Ford’s nephew, Michael Ford, is one of the city councillors expressing support for his uncle’s planned legislation. He said the premier is fulfilling his promise to voters to find “efficiencies” in government. “The PC party ran on reducing the size and cost government, making government work more efficiently and effectively for the people it serves,” he told CTV News Channel on Friday. Coun. Jim Karygiannis said he’s “ecstatic” the province is putting forth this legislation and said he’s been a longtime supporter of reducing the number of city councillors in Toronto. He said the current ward boundaries favour the city’s downtown core and neglect those outside of that area, such as his Scarborough-Agincourt Ward 39. “I’m looking for equality, I’m looking for transparency, I’m looking for people to have the better representation and making that move is good representation,” he said. Coun. Giorgio Mammoliti of Ward 7, York West, is also in favour of decreasing the size of city council and said most people will “love” the decision. The only people who may be unhappy about Ford’s plan, according to Mammoliti, are the NDP councillors who he accused of spending taxpayers’ money and taking up most of the time speaking in council chamber.